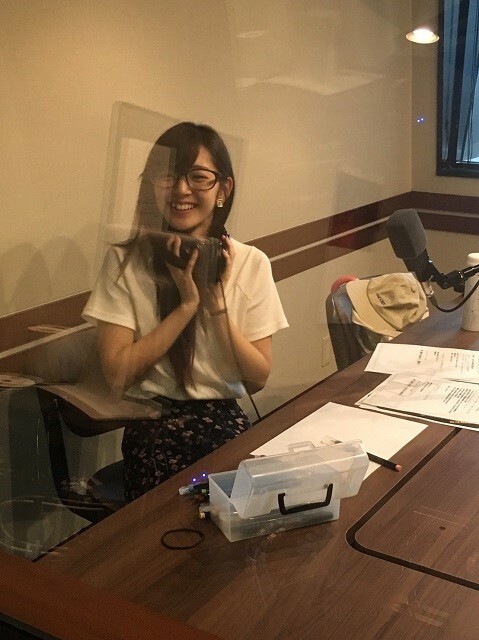 In this second ‘Nega-posi corner’, Airi will take a negative situation submitted by a listener and spin it around into a positive one! The first situation is one that’s familiar to Airi: Often dozing off. 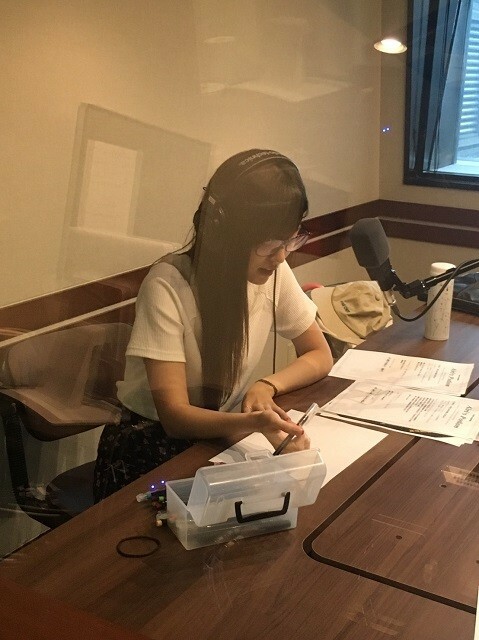 Airi can really sympathise with this listener: If she gets off work early, she’ll have a million things that she wants to do at home, but before she knows it, she’ll be fast asleep. She’ll even miss out her usual blog writing time. By the time her eyes open, it’ll be one in the afternoon the next day. It’s fine during summer break, but she gets down in the dumps if she’s misses classes in that way. She’s noticed recently that she can’t force herself to wake up early, so she’s decided to do things in the middle of the night while everyone’s still asleep. Even if it might not be good for her body, getting things done at least leaves her with a sense of satisfaction. Or perhaps, the listener should stop taking a lie-down after dinner, and keep busy. Airi: I got it! You should dance to ℃-ute’s songs at home! That should immediately wake them up! Then the listener could settle what they want to do, and sleep well in the morning. She goes through the same cycle! Just think, Airi might be staying up late at the same time, doesn’t that charge you with positivity? She also recommends relaxing the neck and shoulder muscles, and doing seitai. Next letter: This 21 year old female listener wants to be in a romantic relationship, but isn’t attracted to those around her. And recently, there doesn’t seem to be anyone attracted to her either. She asks Airi what she should do in order to avoid being forever alone. Airo recommends that the listener watch the Monday 9 p.m. drama ‘Suki na Hito ga Iru Koto‘. It just ended recently, and Airi’s still suffering from ‘SukiKoto loss’. She recommends the listener watch it and sympathise with the protagonist Misaki, so that she can go on by imagining how it is to be in love. 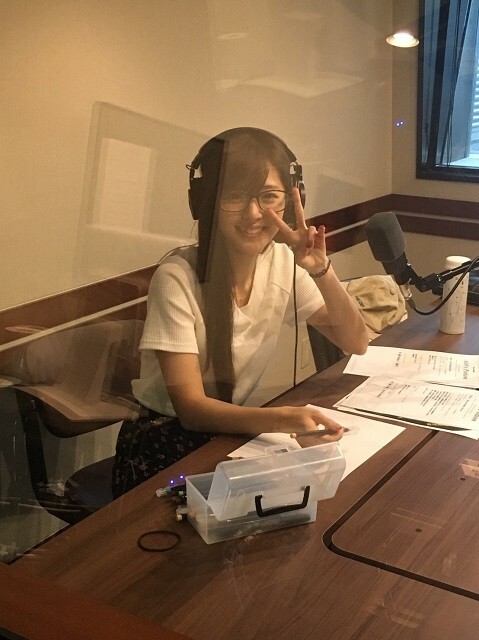 Airi points out that, at 21 years old, the listener still has a long life ahead of them. The theme is ‘Songs that give you courage‘. The first recommendation is Abe Mao’s ‘Believe in Yourself’. Hagiwara Mai mentioned it in a blog post. Despite all their efforts, the recommender gets into slumps when they compare themselves to others. When that happens, they’ll listen to this song. It drives them to do their best. Airi likes this song as well. Like the recommender, she also heard it through Mai. Hearing it first thing in the morning, it’s packed with messages that will drive whoever that listens to it to work hard the rest of the day. Airi listens to this song almost every day. Abe Mao’s powerful voice from the very start charges her with energy. Next recommendation is Mr. Children’s ‘Running High’. When the recommender was job hunting, they would listen to it to build up courage before important interviews. Airi sees where this is coming from – job hunting is a really discouraging period of time. Airi really likes Sakurai-san’s singing, and hopes that she’ll get to go to one of Mr. Children’s concerts. The theme is ‘autumn-ish photos‘. 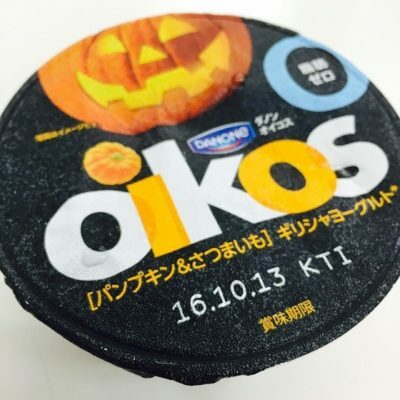 The photo Airi would like to share today is ‘Oikos‘. It’s a yoghurt that Airi will often buy whenever she goes to convenience stores recently. She often has it for breakfast, and it’s often provided as breakfast during her ‘Ray’ magazine photo shoots as well. It’s delicious and it fills her up. The one pictured is a seasonal flavour – pumpkin and sweet potato. Airi’s willing to give things a try, and this gave her an early taste of autumn. She recommended it to Nacky, another yoghurt lover, and she recommends it to the listeners as well. Airi: I’d like you to experience autumn through your mouths. The next photo comes from a listener. Going into autumn, the temperature has started to cool, and the listener’s dog also likes it when it’s colder. The dog doesn’t really go on walks when it’s hot, so they took the dog on a walk on a cool day. That’s when they took this cute autumn photo. Airi tends to fall sick when autumn rolls around, getting head colds. She’ll usually make preparations for those beforehand. This year, she made preparations just in time, but she’s currently doing well. Airi finds the dog really cute, and the ground at its feet brings out quite an autumn mood. Airi’s dogs don’t like being leashed, and they won’t go out when they’re leashed. She finds dogs soothing. All the ℃-ute members own dogs. The other day, Okai Chisato brought her dog to their rehearsals, and Airi gave it a hug. 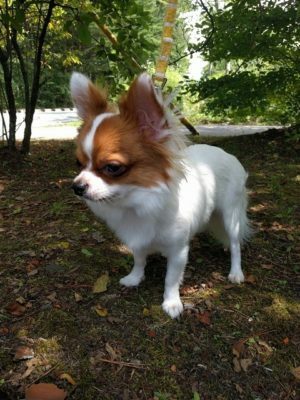 It was apparently the first time that dog had been outside, so it was shaking with nervousness, which Airi found ADORABLE!!! The sight of Airi holding a dog was an unfamiliar sight to even the members of ℃-ute, since she doesn’t put up photos of her with her dogs on her blog posts. A listener explains how to deal with hiccups: Take slow breaths. Breathe in for 10 seconds, hold your breath for 10 seconds, breathe out for 10 seconds. Before reading this, Airi would usually deal with hiccups by holding her breath for 20 seconds. But she finds it really tough, her face would turn red as she held her breath. So maybe 10 might be enough? She usually can hold her breath for about 18 seconds, so maybe next time she’ll try this listener’s suggestion. And the final song is Babymetal’s ‘Karate’. Airi went to their Tokyo Dome concert the other day, the Red Night. It was her first time at a Babymetal concert. Note that Moametal-chan likes Airi, and Airi’s grateful that Moa talks a lot about her. But Airi found Moa to be completely different at the concert. Compared to how she is when they they’re having normal chats, the Moa at the concert was cooler. Well, the three of them were really cool. The concert also showed Airi the difference between metal and rock. The concert was intense, it felt like an overseas concert. She hopes that she’ll be able to another concert – they were really cool. 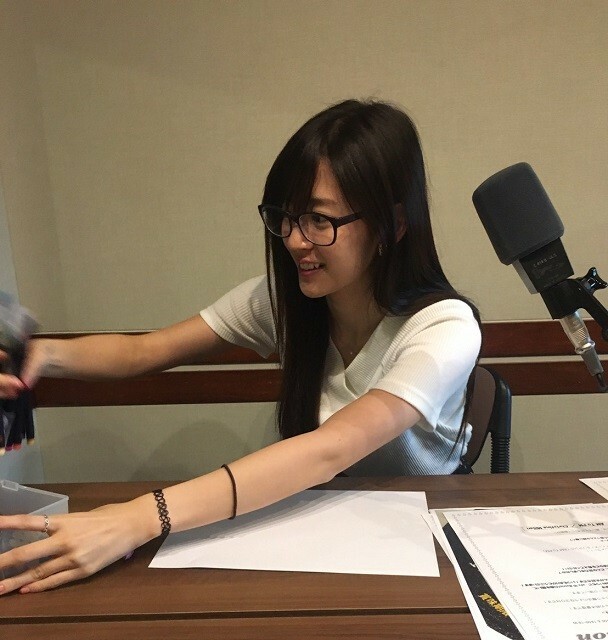 Airi: And so, today we’ll part while listening to Babymetal’s ‘Karate’-DEATH! It’s cool that she went to a baby metal concert. I wonder if she was in the mosh pit. She was in the VIP seating, so no. She was invited.